Damp proofing at its simplest is preventing walls from acting like a sponge and drawing water up from the ground ( Rising Damp ). Modern buildings are constructed with a tough Damp Proof Course ( DPC ) sandwiched between the bricks right around the house just above the foundations. This damp course acts as a physical barrier prevents damp from rising up the walls. 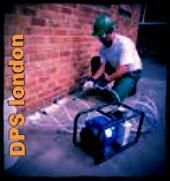 To remove your damp you need to get specialists like us. You will need someone who is using products safe for you and your environmental, products effective and certified. It is important that specialists will take care of your house and problems. Only people with experience can deal with your issues. If your Damp Proof Course isn't working effectively you may need a new one. The most common remedy is to drill holes in your wall and inject Damp Proof Cream or Liquid but there may be alternative solutions.